Naruto RP Saga » Hi no Kuni » Konohagakure » Lukewarm Introductions. 「A comfortably cool evening had befallen the Hidden Leaf. A chilly breeze would lazily dust the dimming streets every so often as the day drew to a lackadaisical close. The setting sun cast a warm, almost heavenly orange glow over the village whose roads were populated by stragglers; most had retired to their homes for the day, and those that lingered were either shinobi on patrol or civilians enjoying the late-summer weather. Yet things were not as pleasant as the dull night teased. The Kimura Compound was bustling with activity, congregated around the Clan Elder-- known to the Kimura as “Sōzetsu Ryū”-- in his private residence. Most of the clan conversed outside with a solemn look, whilst the most illustrious and higher ranking of their internal hierarchy was inside. Just by passing through, one might pick up bits of context from the various conversations that the clans-members indulged in. The Elder was ill and being treated by healers. Many believed that he was finally succumbing to his advanced age, whilst others held on hope that he would pull through yet again like he had done so in the past. Another passing topic one might have picked up on was the Clan Elder’s successor-- or apparent lack of one. Takao’s militant stature carried him through the gathered crowds, garnering looks from those he passed by. They were not particularly looks of awe or wonder, nor were they looks of disdain or scorn. Primarily, they were gazes of slight confusion and recognition; many looked as though they recognized him in some capacity but couldn’t quite place a name. Whispers built amidst them and carried his name after a moment of his passing by. The heavy thud of his boots on wood slowly disappeared as his legs carried him up the deck stairs and through the shōji, which was closed gently behind him. From there, he was directed by staggered gaggles of mingling Kimura that pointed him in the direction of the Elder’s location. He navigated the rest of the house by himself, intimately familiar with its layout from visits earlier in his life. As he reached the room, his knuckles rapped gently against the wood thrice before entering. He slid the shōji open and was greeted by the sight of nearly a dozen individuals. Most were familiar to varying degree, though three stood out. His mother and sister, who were knelt at the bedside of the Elder, their hands alight with green aura that hovered over his chest. Their gaze, mirror images of his own black orbs, lifted and brightened as he entered. “Ahh, Sweetie! You have great timing. Come, give us a hand please.” His mother requested, and he obliged. With Takao’s presence in the room, the nonessential personnel quickly cleared out, and barely half remained. Nearly half an hour passed by before they were through and the Elder was left to rest. The half-dozen remnants of the previous tenants had dispersed, and Takao was left with his mother and sister. “He looks worse.” Takao mused, his arms folding at his chest. “Mmh… His age is beginning to show itself in more ways than just his face. We’re not sure how long he truly has left.” His mother said as they walked down the hall toward the doors. “Oh come on-- that old man has been knocking on death’s door for years. I betcha he’s got at least a couple years left.” Takao’s sister chimed in, using her jovial tone and typical light hearted humour to lift the mood. “Relax, Ma. We’re just kidding around. Takuma would’a laughed too.” Takao grunted as he rubbed the back of his head. The familial banter continued as they reached the doors and proceeded outside into the courtyard, where the majority of Kimura had dispersed since Takao’s arrival. “I’m gonna hang back for a bit. I’ll catch up with you guys later.” Takao said, coming to a stop at the edge of the deck as his mother and sister continued walking. “Seeya, brat!” His sister said with a wave. “Don’t stay out too late, Takao sweetie! It’s supposed to be a chilly night and you might catch a cold!” The dark-haired woman said as she waved on her way out of the compound. A characterful, comical grimace contorted his attempt at a smile and he returned the wave. Strolling through the streets of the Village, Kennosuke was enjoying the cool evening air. It was perfect training weather and since he hadn’t done much all day, he figured he could get some training in once he made it back to the Compound. With his thumbs tucked into the sash around his waist, he made his way back toward the Kimura Compound. The streets were near empty, just the odd Shinobi or civilian enjoying the night as he was. It was nice, the quiet. He moved at a leisurely pace, enjoying the walk as much as he could. Not all nights were as quiet as this one. A quiet that was broken when he finally made it back to the Compound. A crowd had congregated around the Clan Elder’s personal residence. Kennosuke makes his way through the crowd and was able to glean the reason, The Elder’s health had declined and he was being looked after by healers. He is passed by a tall, militant looking Shinobi, whom he felt like he should recognize but, he couldn’t put a name to the face. The shinobi disappears inside the Elder’s resident and Kennosuke turns away, easing his way from the crowd and heading toward the training grounds. He had no reason to stand and gawk at a dying man’s home, no matter who he was. His time was better spent on the training field, because as a Shinobi of the Kimura, he would help carry the legacy of the Elder with his talents on the battlefield. The rest of the Compound was fairly empty, as most were gathered around the Elder’s home. He arrives at the training field. Torches had been lit around the field and the sun was casting its last bit of orange glow across the sky. Kennosuke stripped his shirt off and tossed it onto the ground. He hadn’t worn his normal red body suit and was now bare chested. The scar that started on the left side of his head traveled down his neck and and across the front of his chest toward his right pec. It was obviously a claw mark from his fight with the bear when he was a child. He slowly draws his sword, Rekka and lays its sheath on the ground near his shirt before he begins moving through a complicated and acrobatic Kata. Slashes, stabs, flips, he moved through the motions gracefully and though He had done this same Kata many, many times, it was mainly used as an opener for his training. While he knew it wasn't as good as actual training or fighting, it certainly helped to get his blood flowing. After this he would begin to incorporate his jutsu, but for now he would focus his mind and body for the training ahead. His sword style was mainly one handed and focused on speed, which is why he used a short Ninjato. Between reaping the benefits of being so close to his opponent, he was also making up for his lack of a good grip as he was missing fingers on his left hand. Using a two handed weapon was tough, so it made sense to use a single handed weapon. He finished his Kata and stood there for a moment, his sword held low, panting slightly. Once he caught his breath he would continue his training, but for now he just took a moment. He reflected on his movements, replaying them over in his head. He enjoyed this, the quiet time alone on the training yard. No distractions or no interruptions Just him and the hard packed dirt of the yard. 「With the departure of his family, Takao slowly descended from the porch of the clan elder’s home and began his stroll around the Kimura compound to clear his head. Unexpected responsibility had begun to encroach upon him from all directions; some of it was brought upon by his own choices, and the rest was thrust upon him for merely maintaining the positions that he did. Reputation was a dangerous thing in the shinobi line of work, and even more dangerous toward the lackadaisical lifestyle he had only just begun to enjoy. As he walked, a symphony of thoughts churned out a deafening chorus in his head. The inevitable death of the Elder left the Kimura without leadership, and there were only a few of his clansmen that fit into such a role. Eventually, the question would fall to him, and he dreaded what his answer might be. Shaking the thoughts from his head, Takao’s gaze fell sidelong to the torch-lit training field his mindless stroll had taken him to. Ever interested in the progress of the village’s youth, he opted to linger for a moment and bear witness to his manner of training. He noted the presence of the large scar, origins unknown to Takao though educated guesses could place it as a wound sustained by an animal or the like, yet focused primarily on the movements practiced in his kata. Similarities were drawn in his head between the practitioner, who looked perhaps a decade younger than himself, and his own childhood spent in a similar training ground drilling the same motions over and over at the violent behest of his father. Such memories boasted their own off-brand taste of nostalgia that he wasn’t entirely sure that he cared for. Per the usual, Takao’s inner social butterfly decided to show itself. 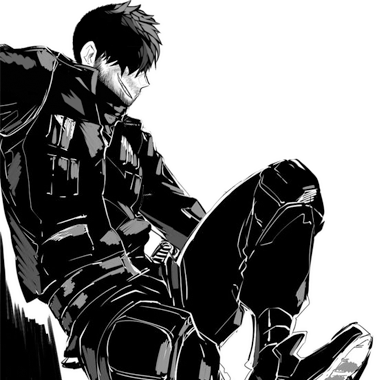 With a casual stride, he tread around the gated training grounds to the entrance and approached Kennosuke with hands dug deep into his pockets. “Nice moves.” Takao said in his typical monotone, blasé coalesque eyes gazing down at him from a handful of meters away. His cold-as-stone stare shifted to the blade he held, regarding the decorations that placed its origins in the hands of a Kimura. “Nice blade too.” He said as his hand brushed over the bandages wrapped around his right arm. The seal formulae was released and in his grasp appeared the handle of his bladed tonfa, Muninn. As Takao’s loose grip on Muninn allowed the blade to rotate toward himself, he effectively flipped the handle of the heavy weapon to face Kennosuke’s direction, offering him the opportunity to take it as he spoke once more. He worked through the kata he just did in his mind, replaying each movement looking for those small inconsistencies on where he could do better next time. His eyes were closed and he was about to begin again, his muscles were just about to surge forward when a voice suddenly. His eyes snapped open and he fought the urge to move into a defensive stance out of pure habit, but he recovered from being startled and relaxed visibly, Rekka dropping down to his side. The tall man who had walked through the crowd stood before him and was speaking to him, commenting on the Kata he had just preformed. “Thanks..” Kennosuke says quietly, still not able to place the mans name. He knew that the man was someone of importance as he just strolled into the elder’s home, but Kennosuke had always been a bit of a loner even when it came to other Kimura. He knew that he knew the man’s name but he couldn’t for the life of him think if it. The man shifted his cold gaze to Rekka and approved of it as well before he summons his bladed tonfa to his hand. It rotates in his hand and he offers it to Kennosuke, while asking to see his sword. Not seeing the harm in it he nods. He lays the blade across his left forearm, with the hilt in what was left of his left hand and offers it to Takao, while reaching out taking the bladed tonfa himself. “I like unorthodox too, but i'm limited on what I can use right now given my hand.” He says, as he glances toward his missing fingers on his left hand. Once Takao took Rekka from his hand, he would take a step back and and brings the bladed tonfa up before waving it around slightly as if inspecting its usefulness to him. It was a nice weapon sure, but he would rather stick with Rekka for now. “I don’t believe we’ve met before honestly. I was a bit of a recluse before I made Genin. I am Kennosuke.” He says sweeping the bladed tonfa downward, then returning his attention the the man before him. Hopefully, unless this man had advice for Kennosuke, he wouldnt take up too much of his time. He had to train for the Chunin Exams and prepare for whatever this Mask would bring. Talking was the least of his worries right now, but there was no need to be rude to anyone, so he remained at ease for now. He would admire the tonfa as he spoke, as it was an exquisite weapon. Not his style, but njce nevertheless. 「Takao’s scar-ridden hand reached out and grasped the hilt of the blade as it was offered. Digits wrapped around the handle as he carefully pulled it from Kennosuke’s possession and lifted the blade. To him, it felt light like a feather. The shape was awkward compared to what he was used to, the way it pivoted with his wrist and how the balance of the blade tilted in response to slight motions were similar in some ways yet alien in others. Quite some time ago he had decided that the traditional blade did not suit him or his preferences. They were traditional and common for a reason, that much was true, but Takao had always walked a skewed path forward that kept him from abiding by the norm. His gaze shifted back to Kennosuke at the mention of his hand, then shifted down to the aforementioned extremity to note its lacking digits. His eyes drifted back to the weapon just as quickly as they had focused on his handicap, shying away from the possibility that he might be caught staring. Another moment of examination befell the blade in Takao’s grasp before he turned it and offered the handle back to Kennosuke shortly after the latter’s introduction. “Nice to meet you, Kennosuke. I’m Takao.” He said, reciprocating the introduction as he returned the weapon to Kennosuke. He had offered his own item in exchange as an extension of trust, and thus was expecting his weapon to be returned as well. “I don’t believe we have met before, yes.” Takao confirmed after briefly mulling over his face and name. He had remembered hearing it somewhere, or perhaps reading it, but such a sensation was common for Takao who spent large portions of his free time sifting through countless shinobi files that he had access to. Some might consider it prying, or even an invasion of privacy, yet Takao persisted that combing through such information was imperative to his self-imposed role in the Hidden Leaf. The raven-haired shinobi had long since come to terms with the fact that he would be the roots of the village, shrouded by the canopy of the Leaf’s future, yet steadfast in his endeavour to keep the village standing. “So, you’re out late this evening, and I couldn’t help but notice you were doing a bit of training. Was there something in particular you were preparing for?” He asked, curious as to Kennosuke’s purpose in the training grounds when the chilly grasp of darkness had already begun to take hold of the village. His hands rose up and digits splayed out in a harmless manner, accentuating the words that had preceded his movement. After examining the weapon for a moment Kennosuke smiled slightly. It was indeed a nice piece of hardware, but it wasn’t really his style. Not just because of his hand, but he just in general preferred the feel of his own sword in his hand. He could feel the man’s eyes glide across his fingers, a gaze which was just as quickly averted. It didn’t bother him really, people looking at his hand. A large number of people didn’t even notice until he pointed it out. Takao reversed his sword and offered back to him handle first, obviously wanting to trade back and so Kennosuke handed over the bladed Tonfa and retrieved his own blade. In a quick motion he sheathes the blade back at his waist and begins listening to Takao as he spoke. He hoped that he didn’t off as too much of a fanboy. In truth, he could certainly use the tutelage. Between the exams and being picked for this special training exercise, he felt lacking in experience thus far and being taught by one of the best Kimura Shinobi may just give him the upper hand he needed to do well in both. He was slightly surprised that Takao had taken interest. Since Rikimaru and Rin had left he had been pretty much alone and as used to being alone as he was, it felt good to have a possible mentor. 「With Muninn returned to his possession, Takao affixed the unorthodox place to his arm and placed a wad of chakra upon it. As the seal upon his right arm was given its own charge of energy, the blade disappeared in a cloud of smoke, leaving behind a new string of kanji on the bandages to indicate its place sealed within the fabric. His gaze shifted and fell upon Kennosuke at the mention of his name having been heard. In the musings that followed immediately after, he remarked that such a statement would have bothered him greatly in the past, during a time when he wished his name and visage unknown. Even now, it certainly didn’t make him comfortable that his name carried weight. It meant people knew of him and what he could do, and for somebody that acted as carefully as he, it was a disturbing sensation. Yet he would endure his discomfort, and not so much as a twitch in his face gave any indication of his thoughts. “No friends or family, huh.” Takao parroted. A breath escaped his nostrils and a wistful smile appeared on his face. “Well, consider me your first then, yeah?” Takao said as he strode to the nearby edge of the training grounds, where a chain-link fence separated the area from the street, and shed the cardigan he wore from his shoulders. The garment was tossed over the fence and he returned to stand in front of Kennosuke, his arms and the scars that decorated them bare to the late-evening sky. The sleeveless undershirt displayed both the ANBU insignia on his left and the Kimura flames on his right, the former looking considerably more fresh than the latter. “Seems like you have the physical part of training down, so not much I can really offer there. How about I teach you a few techniques instead? I’ve got some fairly new ones that you might find helpful in the exams. There’s Cruelty Devouring Blaze, which is free-form manipulation of flames… Devouring Divinity, which is a defensive technique where you consume the chakra from attacks and use it to prepare your own techniques, or…” Takao said, eager to list off the lower-level techniques he had designed en masse in preparation for teaching others under his tenure.